The Apple (AAPL) Red Dog Reversal: Where Will it Lead? 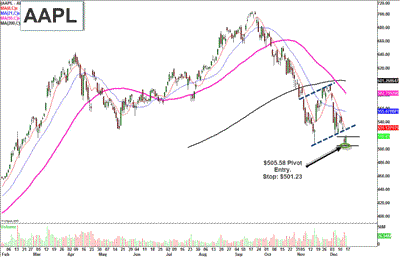 HomeBusinessThe Apple (AAPL) Red Dog Reversal: Where Will it Lead? Before the market opened today, Apple (AAPL) was trading all over the map. It dropped as low as $496 before rallying narrowly into positive territory by the open. After very heavy action in the stock last week, it was hard to have an edge either direction. Without a clear-cut set-up, it was hard to short a stock that was down $50 last week, but also hard to get long such an under-performer. The new point of reference was $505.58. AAPL saw a quick push lower through that level, and turned into an 80/20 Red Dog Reversal strategy when it traded back up through it. 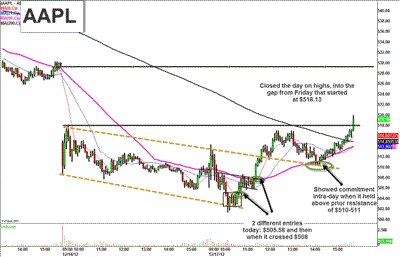 Stops were then placed at the morning low of $501.23. The chart below was tweeted around 11:00am ET to alert traders about a potential reversal. The key for AAPL today was its ability to build on early morning strength. Apple showed commitment throughout the session on a 5-minute chart. 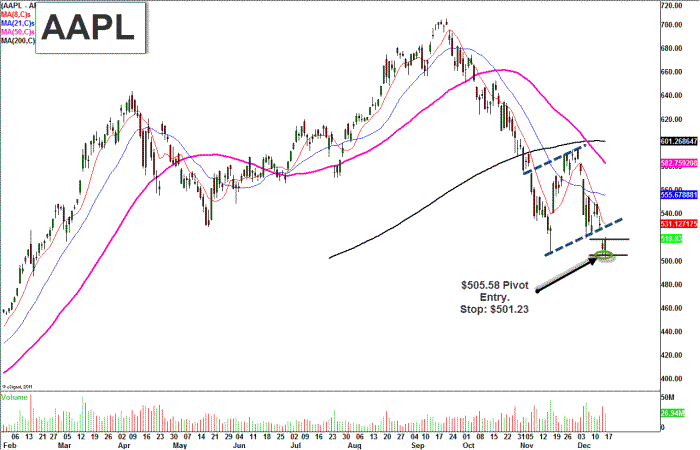 The first entry was $505.58 and once AAPL held above that level, it gave traders another entry once it broke above the flag pattern at $508. AAPL closed the day on highs, up 1.77% and in the gap from Friday that started at $518.13. Today’s action is constructive as it relieves some of the oversold pressure on this stock. 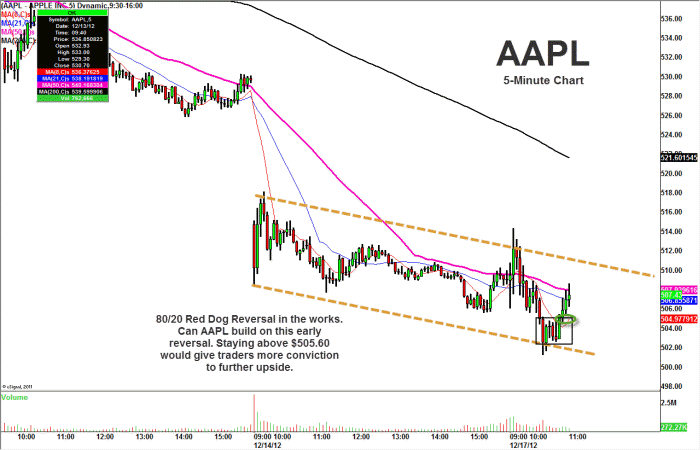 The AAPL Red Dog Reversal provided a great cash-flow trade, but what will it lead to? The stock now needs to now build on that intra-day strength and show commitment on the daily chart. At this point, AAPL is a broken stock and has a lot to prove going forward. Tomorrow’s action will be key to judge the overall validity of today’s move.